On Thursday April 16, 2015, You Dared to Leap And Changed Lives! Rappelers descended 19 stories to raise funds for our new Vancouver Urban program. Thank you to our 75 amazing rappellers and to everyone who partipated in our Dare to Leap event. It was an incredible day and so lovely to meet so many awesome Outward Bound Canada friends, supporters and alumni, and together we raised $100K in support of at risk youth across BC! Click to the right of the photo below to browse photos from Dare to Leap 2015. Please also feel free to check out any press on the event at our Press Gallery here. This spring, become a real life hero by participating in the Dare to Leap event in downtown Vancouver. Your efforts will support Outward Bound Canada’s new Vancouver Urban Program, providing hundreds of ‘at-risk’ youth the opportunity to take part in a life-transforming experience. Last year alone, Outward Bound Canada worked with over 2000 urban youth between Toronto and Vancouver, introducing them to the incredible wilderness offered right in their own backyard. Outward Bound Canada’s goal and vision for 2015 is to grow this program to allow more underprivileged youth to be inspired through outdoor experiences, giving them the chance to reconnect with their true selves. 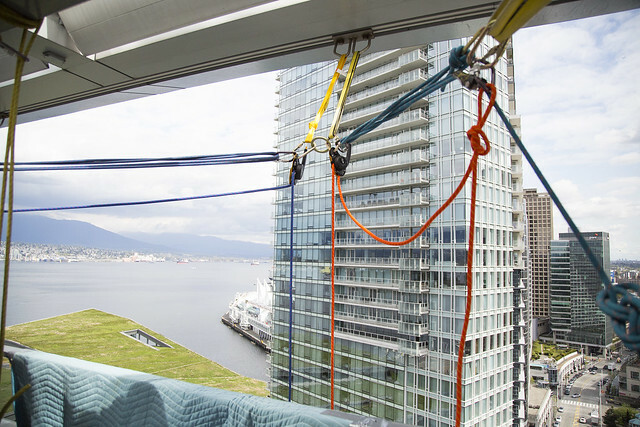 On April 16th 2015, 75 brave Outward Bound supporters will rappel 19 stories down the side of the Shaw Tower, the third tallest building in Vancouver. Register today and Dare to Leap in support of youth ‘at risk’ programs! Spaces are limited and will fill up quickly! There are only 75 spots. Be one of the first 75 supporters to raise $1000 and secure your place in the Dare to Leap event today. To register now click here. Award for Top Fundraiser: Our event design manager, Pinnacle Pursuits will be awarding a full day adventure-based corporate training and team-building event to the top fundraising rappeller for up to 15 employees, valued at $3,500.